Please note: We’re sorry, but no online or wholesale orders are being accepted at this time. Caddy Products, LLC, is actively looking for a buyer. I'm John Lucas and I invented the Face Caddy. Thousands of people have tried Face Caddy and found relief. make Face Caddy available everywhere. that wraps around your head. Face Caddy fits any size head. Patients spend thousands of dollars on splints and surgery to help TMJD. But one of the most affordable, non-surgical solutions to help the pain is the application of moist heat to the jaw area. Face Caddy is perfectly designed to comfortably hold two heat (or cold) therapy packs (included with each Face Caddy) on the face to help calm ragged TMJ nerves, relax the joint and settle your anxiety. I bought Face Caddy for my TMJ. Face Caddy can be used as a heat pack or cold pack. Its reusable gel packs fit perfectly inside the head wrap. TMJ Hope is one of the most active organizations for those suffering with TMJD, or Temporomandibular Joint Disorder. 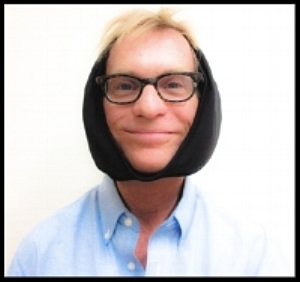 Face Caddy is the "Official Hot and Cold Wrap of TMJ Hope." When you feel a migraine coming on, do you apply ice to your forehead, back of the neck or crown of the head? That may be where you feel the pain, but the migraine may be triggered by inflammation or misalignment in the jaw area. Applying moist heat or cold therapy to that area may help calm those trigger points that are causing the pain. Our heat packs and cold packs apply therapy to the trigger points for TMJ and Migraines. If you're having wisdom teeth extracted or other oral surgery you'll want to apply cold therapy at home. Forget frozen peas! They are hard to handle, they drip and they are a mess. Having a Face Caddy ready at home can make your recovery so much easier. Your Face Caddy will be your new best friend! Face Caddy is a heat wrap and a cold wrap and now comes with FOUR reusable gel packs. Face Caddy can help your recovery after many types of procedures by applying hot or cold therapy to the sides of the face. It also provides light compression. Having a Face Caddy ready at home will make your "down time" much more relaxing. You'll be free to move about, use your hands, and most importantly, rest comfortably. Look your best and let Face Caddy help! Hot pack and cold packs are perfect after a facelift, oral surgery, wisdom teeth removal, chin lifts and other plastic surgery.